Has there been a transformation of public service employment relations in Europe since the crisis? Public Service Management and Employment Relations in Europe examines public service employment relations after the economic crisis, including analysis of more than thirty years of public service and workforce reform, and addresses the interplay between an emerging post-crisis public service sector and the consequences for the state, employers and trade unions in core public services. Written by leading national experts, this book places the economic crisis in a longer timeframe and examines how far trends in public sector employment relations were reinforced or reversed by the crisis. It provides an up-to-date analysis of the restructuring of public service employment relations in 12 major European countries, including analysis of little studied central and Eastern European countries. This book will be vital reading for researchers, academics and PhD Students in the fields of Public Management, Public Administration, Employment Relations, and Human Resource Management. 1. Emerging From the Crisis: The Transformation of Public Sector Employment Relations? The Uncertainties of Endless Reform: Which Public Service Employment Relations after Austerity? 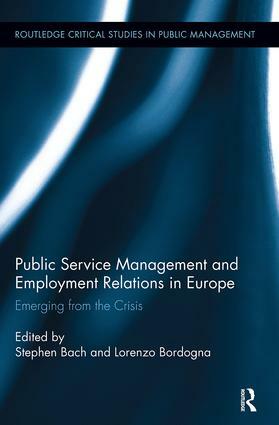 Public Service Management and Employment Relations in Europe: Emerging from the Crisis? Stephen Bach is Professor of Employment Relations at King’s College London, UK. Lorenzo Bordogna is Professor of Economic Sociology at the University of Milan, Italy.